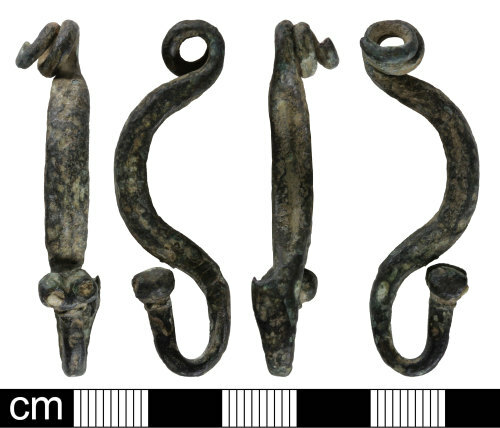 An Iron Age La Tene I type brooch dating to the period c.400 - 200BC. The head consists of an integrally cast spring with two loops remaining ending in an old break. The pin is missing. The bow arches steeply upwards from the head and expands from a width of 3.84mm to 5.59mm. There is a central groove along the obverse of the bow and traces of other decoration which are indistinct due to wear. It then arches downwards at a steep angle and simultaneously tapers into the leg. At the bottom of the curve the leg expands on one side to form the catchplate which rolls upwards. The leg then curves upwards and back on itself to face the bow. The brooch terminates in a foot consisting of a horizontal ridged collar followed by two circular knops positioned side by side. Each knop has a central circular recess containing a degraded off-white product, possibly coral or enamel. The brooch measures 47.49mm in length, 8.42mm in width at the spring, 3.74mm at the foot and weighs 9.06g. Similar brooches are illustrated in Hattat, R. 2000, p 288, fig. 147, no. 1448 and Jope E.M. 2000, Plate 36, figs. a - d.